- As shown. Ball per player. - Give players various juggling challenges. - Players try to improve their touches (suppleness, control and foot-eye coordination) by juggling with different surfaces of their feet & body. - All players have a pinnie in their shorts. - Half the players are in a triangle; Other half are outside of triangles. - 3 players start as defenders. - Defenders attempt to steal an attacker&apos;s pennie that is not in a triangle. - Attackers can enter triangles by tagging the player standing in the triangle. - If an attacker is in a triangle, they must exit immediately after being tagged. - Should an attacker lose their pennie, they continue playing the game as normal. - Last attacker to still have their pennie wins. - As shown. Half with balls in area. Half w/o balls in triangles. 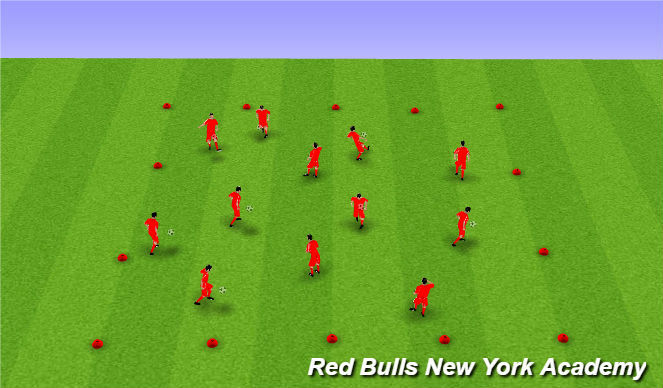 - Players with the balls look to pass to players in a triangle and replace the player they passed to. - Players that receive in a triangle look to exit a different side than the ball entered and play a pass as quickly as possible to another player in a triangle. - Players receive a point each time they receive a pass. - Should a player play a bad pass or their ball goes out of bounds, their score goes back to 0. - Once defenders are added (holding a pinnie), defenders look to steal a ball from any attacker and score in a PUG goal. - Should defender win the ball and attempt to score ending with the ball going out of play or a goal is scored, the defender gives his pinnie to the original attacking player and the two switch roles. - Eye contact / quality of pass. - Body position to receive, receive with back foot, first touch out of feet, head up to play. - Ability to look up and play next pass as quickly as possible. - Head up as ball travels (reading pressure / checking shoulder or space). - Composure in possession (once defenders are added). - Add passive pressure after playing pass. - Add defenders who attempt to score in PUG goals. - 4 teams of 3. - 3v3 Format. 3 points for win; 1 point for tie. - Timing of movements (2nd attacker as ball travels; 3rd attacker on eye contact).